Most prominent of the Spice Islands, Zanzibar has a potent mix of history, legends and unique cultures. 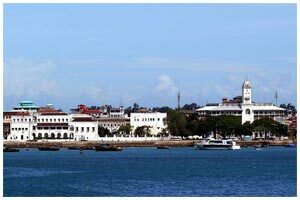 Visually stunning with exceptional natural beaches and the haunting architecture of Zanzibar town, the island has lured travelers to its shores for centuries. Its past was dominated by merchants, rulers, explorers, scholars - today tourism is playing a key role. Zanzibar provides the perfect compliment to an East African beach holiday. Zanzibar is famous for being a major producer of cloves, and infamous as being a slave entry-port, the old stone town of Zanzibar has a fascinating labyrinth of narrow winding streets lined with whitewashed, coral-rag houses with overhanging balconies and magnificently carved brass studded doors, shops, bazaars, mosques, courtyards, squares etc. Outside town there are more ruined palaces, Shirazi remains, Persian baths, and magnificent palm fringed beaches with warm clear water, ideal for swimming and snorkelling.